Early last week, baseball legend Jose Canseco explained gravity to the Internet. He tweeted that "ancient gravity was much weaker" during the time of the dinosaurs, which allowed for their massive and nimble size. Needless to say, Canseco was ridiculed for his comments, but very few people actually took the time to explain why he was wrong. Even Bill Nye failed in this regard. Thankfully, some writers have come to the rescue. His nickname in Major League Baseball was "The Chemist," because he was so knowledgeable in the chemistry of performance enhancing drugs and making musculature go big. Reading his recent tweets about the remarkable size of the ancient dinosaurs ... it doesn't sound (read) as though he's especially fluent in physics. This fills me with either joy or dismay depending on what social media messages he provides us with next. Either he's in on the joke and is just throwing us all a curve ball with plenty of break, or we as a society have failed him completely with regard to the fundamentals of planetary science. The ad hominem attack on Canseco was unbecoming of a scientist, as was his laziness at addressing the issue head on. ...By externalizing birth and development, sauropods and other dinosaurs were able to sidestep the costs and risks that constrain mammal size. For dinosaurs, mechanical and other biological constraints might have prevented them from becoming even larger – the amount of time it would take for nerve impulses to travel to a 100-foot-long dinosaur's brain for example. 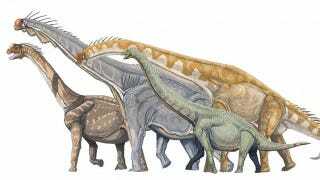 The fact that all the genera that are contenders for the "largest dinosaur of all time" title – including Argentinosaurus, Supersaurus, and Diplodocus – top out around 100 to 110 feet in length might indicate that these dinosaurs were reaching the anatomical ceiling of how large it was possible for them to get. But let's be clear about sauropod size. Biological quirks such as air sacs and laying lots of little eggs allowed sauropods to grow to large size, but these features did not drive dinosaur inflation. There were titanic dinosaurs as well as tiny ones. Dinosaurs did not experience the same barriers as mammals, and therefore evolved a greater range of body sizes. The evolutionary driving forces behind the evolution of truly huge body size are not clear, and likely differed from one group of dinosaurs to the next. Paleontologists have determined the features that made it possible for a creature as spectacular as Supersaurus to exist, but the reason why the dinosaur's lineage ended up pushing biological boundaries of body size are still unknown. ...The truth is that Earth's tectonic plates, on which the continents rest, are always in motion, rearranging themselves very slowly over tens of millions of years. Yet the Moon reliably orbits, which wouldn't be true if plate tectonics made a huge difference to Earth's gravity. In fact, there's another sign Earth's gravity hasn't changed much in the last 100 million years: the Moon is actually moving away from Earth, albeit very slowly. If Earth's gravity had doubled since the time of the sauropods, we would expect the opposite effect. Be sure to read both Switek's and Francis's articles, as they contain plenty more detail and links to relevant studies.